First off I would like to apologize to my readers, we bought a home, moved to a new town, I started a new job and my husband deployed in the last few months so I have been so busy I have not had time to post. That does not mean of course that I did not have time to bake. I always have time to bake. I even baked just this morning, it is part of my weekly routine. Lately I have made lots of favorites from my blog, wacky cake, sour cream coffee cake, black moons, blueberry buckle, and more. Those are staples that are always crowd pleasers. I have also been enjoying a new brownie recipe I found that tastes like box mix, that is going to be my next post, along with my Kentucky Butter Cake I have been making a lot. I am getting back on track for regular posting, I promise! Since I love coffee cake in any language I was excited to recently try a new recipe. I subscribed to King Arthur Flour’s email newsletters and often yummy recipes catch my eye. I highly recommend you sign up if you are a baker. This recipe for Norwegian Sour Cream Cake looked right up my alley. I made it for a church potluck and have to say it was a big hit. At first people were going for a dry brick like corn bread concoction till the word got out about my tasty cake. If you love pound cakes and bundt cakes you have to try this easy recipe. It was a light, moist cake with just the right sweetness and a great vanilla flavor. I had made a berry compote I use often for my cheesecakes from Martha Stewart to top it but I left it at home by mistake. I definitely think that would be a perfect topping, or even just sliced strawberries and cream. The texture of the cake would be perfect for strawberry shortcake and delicious for tea time. You can travel to Norway right in your own kitchen with this tasty new recipe! Preheat the oven to 350°F. Lightly grease a full-size (10″) tube pan, bundt-style pan, or angel food pan. Stir in the salt, baking powder, and vanilla. Add the flour alternately with the sour cream, starting with the flour. Add the flour about 1 cup at a time, the sour cream 1/2 cup at a time. Mix at medium speed between additions, until ingredients are thoroughly combined. The finished batter will be quite stiff. Bake the cake for 60 to 75 minutes, until a cake tester, bamboo skewer, or long toothpick inserted into the center comes out clean. Remove the cake from the oven, and gently loosen its edges. Store the cooled cake, well wrapped, at room temperature for several days. For longer storage, wrap securely and freeze. Yield: 1 cake, about 20 servings. I have tried many coffee cake recipes and have yet to find one I did not like. 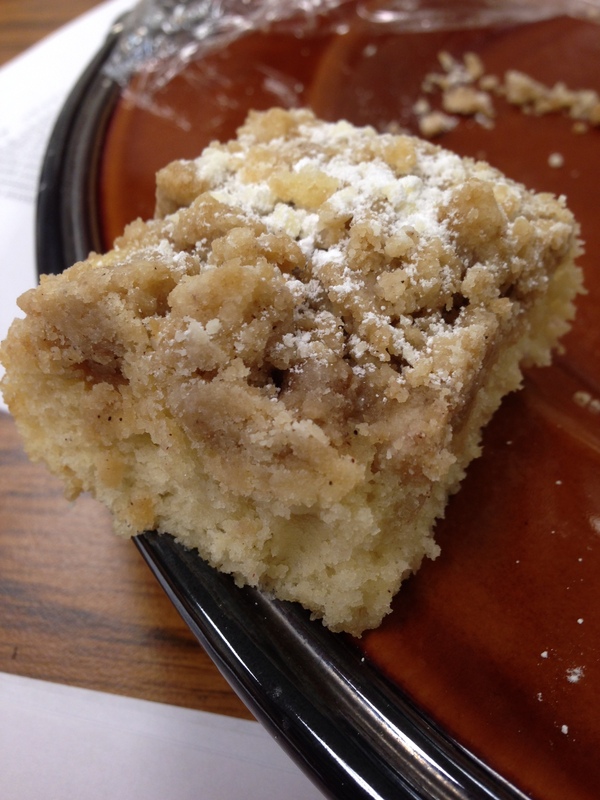 But my most favorite type of coffee cake is a crumb cake. There are a few regular recipes I use but my mom always makes the NY crumb cake version and had given me the recipe. I did not try it until recently and I am glad I did. It was super easy to make and it was the best coffeecake I have made in a while. I should have know it was good because my mom gave it a 6 star rating. 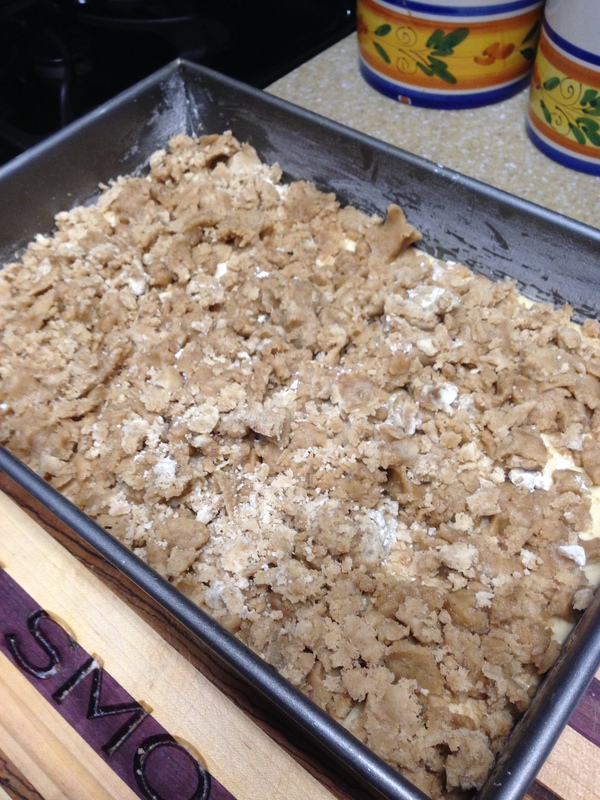 It tasted exactly like an Entenmann’s crumb cake, minus the ingredients you can’t pronounce. So if you need something sweet to start your holiday breakfast off right, try this easy treat and you won’t disappoint! +confectioners sugar for dusting after baking, a must! Sprinkle crumbs over batter so it looks like this, the white stuff is flour, not confectionary sugar (save that for after baking), I just had some flour in the bottom of my bowl. Transfer pan to oven, and bake for 10 minutes. Rotate pan and continue baking until cake tester comes out clean, about 10 more minutes. Transfer pan to wire baking rack to cool. Dust cake with confectioners sugar using a metal strainer for a pretty effect. Cut into three inch squares and store in an airtight container for up to 3 days. Enjoy!!! I recently had a potluck at work and decided to look for a festive recipe to share. I love making cheesecake and it is always a crowd pleaser. 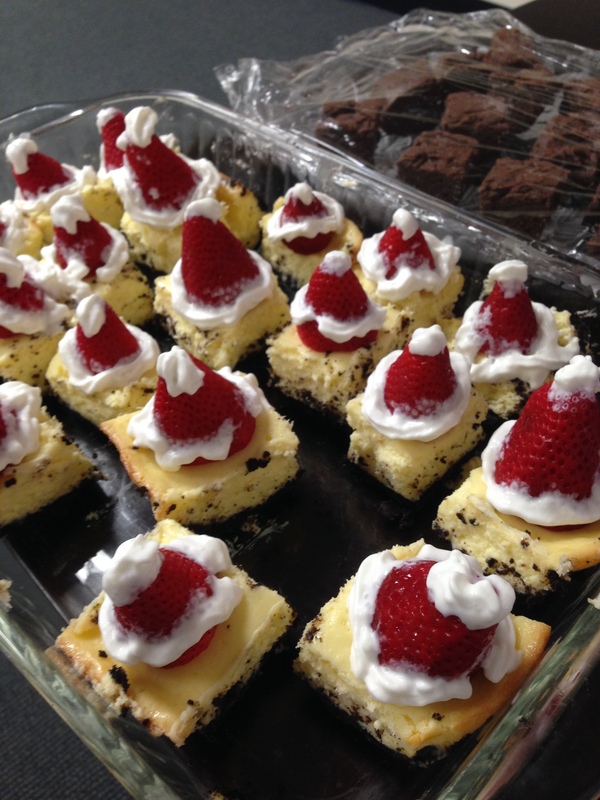 I had seen some fun holiday recipe ideas on real simple and decided to go for these Santa Cheesecake bites (click through the pics to see these). It was easy to make and they came out very cute. If I made them again I would probably cut the squares bigger and follow the steps for the whipped cream piping, as I didn’t have much time so I used a can of whipped cream (gasp!). The cheesecake was surprisingly light due to the addition of the white chocolate I think. I don’t even like white chocolate but these turned out great. Everyone was very happy with the results. Check out the link for some other cute holiday desserts, I think we will make the pretzel Santa hats for Santa this year. Preheat oven to 325 degrees. Line an 8 by 8-inch baking dish with two large sheets of tinfoil (one going horizontally and one over the top of the other vertically. Make sure your sheets are long enough that you’ll have an overhang of foil over the edges of the pan. Also, be sure to mold it well to the pan). Brush foil with 1/2 tbsp melted butter. In a mixing bowl, using a fork blend together crushed Oreos and 2 Tbsp melted butter until mixture is well combined and evenly moistened. Press mixture firmly into the bottom of the prepared baking dish (the bottom of a flat measuring cup or glass works well for pressing crust), set aside. In a large mixing bowl, using an electric hand mixer set on medium-low speed, blend together cream cheese and granulated sugar until mixture is smooth, about 30 seconds. Add in eggs and vanilla extract and mix until well blended. In a separate microwave safe bowl, heat white chocolate chips with 1/3 cup heavy cream on 50% power in 30 second intervals, stirring after each interval until melted and smooth. Pour melted white chocolate mixture into cream cheese mixture and blend on low speed until combined. Tap bowl against counter top about 30 times to release some of the air bubbles then pour mixture over prepared crust in baking dish. To assemble: cut a flat top off of each strawberry and lay flat side down over top of cheesecake. Fill a pastry bag (or Ziploc bag and cut a small tip of corner) with sweetened whipped cream and pipe around strawberry then finish with a small amount over the top of the “hat”. Serve immediately (for do ahead- you can make cheesecake the day before then assemble within an hour of serving the following day). Store in refrigerator in an airtight container. *Don’t use Doublestuff Oreos. I processed the Oreos in a food processor but if you don’t have one you can place them in a large Ziploc bag, seal bag and finely crush with a rolling pin . Since anything with #pumpkin is super cool right now I decided to continue on my fall coffeecake bender. I love when company visits and I have a reason to bake up a special treat. The recipe I found this time intrigued me because it was an accidental success. 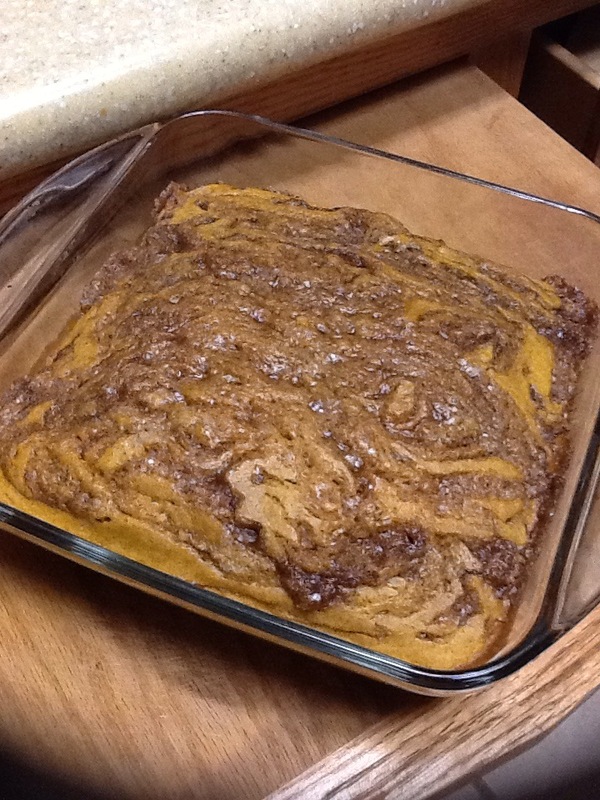 The blogger messed up on another recipe and ended up with this delicious cinnamon swirl pumpkin coffeecake. It was easy to make and insanely delicious. I would have to say it tasted like a pumpkin pie to me, with a glaze on it. I would probably make this again but for a fall potluck or as a dessert for thanksgiving dinner. It was a fun twist on typical pumpkin pie and did not register as coffeecake to me. Regardless, it was scrumptious and it fulfilled that constant pumpkin time of year craving. With a whisk, mix together the flour, baking powder, salt, cinnamon and pumpkin spice. In a separate bowl mix the pumpkin, vegetable oil, sugar, egg, milk, and vanilla. Combine all ingredients and mix together until just combined. 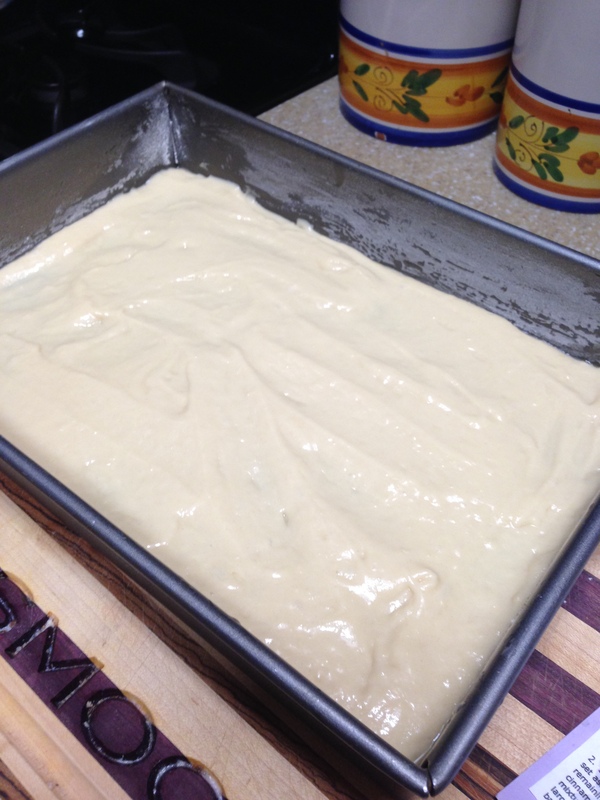 Pour batter into an 8×8 cake pan. Meanwhile in a small bowl, add melted butter, cinnamon, and sugar for the cinnamon swirl. Drop spoonfuls of the cinnamon sugar mixture on top of the batter. With a knife, swirl the cinnamon sugar mixture throughout the pumpkin batter. Bake in a preheated oven at 350 degrees F for about 25 to 30 minutes until a toothpick inserted in the center comes out clean. Meanwhile, to make the glaze, mix together powdered sugar and a little milk. You may have to add a little more milk to get the right consistency. When the pumpkin cake has cooled some, drizzle the glaze over the top of the cake.